I literally copy this saying from Dave Wilson a fraud expert in the Telecom field. He uses it with the following line: 1st of all there are 10% of people who really everyday are looking into the possibility to bend the law if they can. They always look for a shortcut or easy way to make money. Get rid of those people in your life that´s for sure. 10% are perfectly honest and live their life with integrity. The other 80% is ofcourse the most interesting and explained with a simple example, if you find a note of 50 euro in the hallway or street, do you put it in your pocket? There it is 80% does this and this goes much further. Richard Branson thought with not reporting the tax on his record sales he was doing a smart job….NOT. He says it taught him to be always honest in business. Yes that 80% are in general not criminals as such, but that vague grey area and the necessity of interest. For example my grandfather told me he had to steal bread in the 2nd world war to feed his family and at the same time told himself that he would pay the man back…..yes 80% or not….it is such a vague line. A couple billion euros per year are lost in companies, because employees take pens, notebooks, toilet paper, plastic cups to their home. You have no clue how many things are taken from a hotel or restaurant……yes that 80%. While I am writing this we all know we have friends in that 80% and absolutely we are in that category in some aspects of life and it is usually innocent. Integrity is the quality of being honest and having strong moral principles. 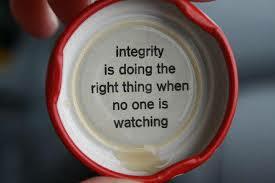 Integrity is a personal choice, an uncompromising and predictably consistent commitment to honour moral, ethical, spiritual and artistic values and principles. Knowing that WE almost all belong to that 80%, let´s be honest to ourselves. Look into the mirror and make that personal choice in life and business. For a change don´t bend that law and get into that 10% who wake up in the mirror and know they are 100% honest. I am pretty sure we all will feel better and achieve more in business together. I am looking into that mirror right now, good luck!